The City Council voted to deny our appeal. And won. Because the developers chose to withdraw the project, give up their permits and agree to build a much better project if we would just stop suing them. How simple is that? We followed the process and excercised our rights as residents of the State of California, under the California Environmental Quality Act. Because as residents of the City of San Diego we are treated like arrogant outsiders by our neighbor down the street, the Mayor, we had to do it ourselves. 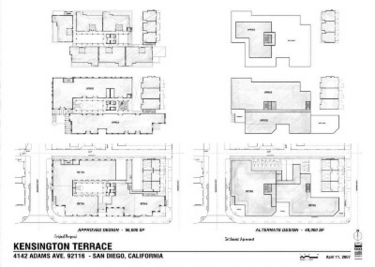 Toni Atkins, we got your process right here. And it works, but not in the way you thought it would. On April 23, 2008 the residents of Kensington reached a settlement agreement with the developers of Kensington Terrace. Attorneys were involved, papers were signed, crap was said, but in the end, we still have some semblance of our neighborhood left. And on April 24th, the Historical Resources Board voted unanimously to designate the Kensington Sign as a historical resource under Criterion A. Wahooo! The new building has been significantly scaled back and no longer requires a zoning variance or deviation in the CN-1-3 (30 foot) zone. The rowhomes on Edgeware Road will stand separately from the main commercial building, aiding the transition into the residential neighborhood. The retail space on the corner of Edgeware Road and Adams Avenue has been scaled back from three-story to one story. The remaining retail/office space in the CN-1-3 zone will be two-story only. The only three-story component will be in the CU-3-3 zone and consists of a 5,000 square foot third floor stepped back on all sides to reduce the building’s bulk. At its highest point the building will be 35 feet, which is the same height as the adjacent Kensington Park Plaza (“Starbucks”) building. The overall building square footage has been reduced from 56,000 square feet to 49,000 square feet. A new plaza has been added on the Adams Avenue side which will help break up the bulk of the building. Seven, free parking spaces have been added at the back of the building off the alley. There is a 20% reduction in the Average Daily Trips (ADTs) generated by the project tenants subject to the Mitigation, Monitoring and Reporting Program. No high-turnover convenience stores are allowed. Other terms were agreed to that address traffic mitigation, parking, retail uses and store size. On March 5th the Heart of Kensington filed a Petition for a Writ of Mandate in the Superior Court of the State of California, County of San Diego, Central District. This action involves a challenge of the City of San Diego’s decision made on February 5, 2008 to approve the development of a 3-story, 56,000+ square foot mixed-use commercial, office and residential project in a low-rise, 1 and 2-story area in the Kensington neighborhood of the Mid-City Communities planning area. The proposed development, known as “Kensington Terrace,” will cause unmitigated adverse impacts to the surrounding neighborhood character, traffic, historic resources, and the overall environment. Our thanks to Council members Donna Frye and Brian Maienschein, who know a pig in a poke when they see one. For Toni Atkins, one dozen dead roses are headed your way. You sold out over 1,000 of your constituents and made litigation necessary. This project is inappropriate for Kensington. Still unclear on how we really feel? Read the Letters to the Editor in the Union-Tribune. Our first victory has been won. We ousted the incumbents on the Kensington Talmadge Planning Group that voted to approve this project, sweeping all seven seats during the March 12 annual Board election. Our thanks to our neighbors who volunteered to run for the planning group board. Kensington, a streetcar suburb of the central urbanized district of San Diego, was originally mapped and developed in 1910 by the Kensington Park Land Company, a group of retired Santa Fe Railway Company executives. The commercial district in Kensington is composed of repurposed original houses from the 1910 Kensington Park subdivision, as well as a number of one and two-story neighborhood shops built in the 1950’s. We are interested in the sensitive and graceful renewal of our commercial district, and specifically, the site of the Kensington Terrace project. Terrace Partners, which includes Sunroad principal Richard Vann and architect Allard Jansen, proposed to build a three-story 56,000 square foot mixed-use project on a block long section of Adams Avenue between Marlborough Drive and Edgeware Road, in the heart of our community. The proposed project would not only be the largest building in Kensington, but would be the largest building in the entire Adams Avenue business corridor from Park Boulevard to Aldine Drive. That represented a significant impact on our community in terms of traffic, parking, loss of historic resources and impact on community character. We did not wish to lose our historic, walkable, friendly neighborhood to some developer's monolithic testament to the "New Urbanism" school of design. If you look around Kensington today, you'll see that 60 years ago they got it right - building articulation, transparency, use of multiple materials, setback, pedestrian-oriented. But they did it in two-stories or less, and they did it with the intent of providing neighborhood-oriented goods and services. We said no to Kensington Terrace as it was originally designed. We wish our City Officials had the guts to do that in the first place. Yes, we are vocal. No, we are not a minority.